Prepare the food for meetings as much as you come prepared FOR the meeting! You want the food to be super delicious but you also want to stay super productive? AMGD has done it for you. Impress everyone with AMGD ever-expanding range. We even go the extra mile to personalise for your brand. We do not compromise on the quality and freshness of our meals even with large orders! Each meal is conveniently packed for individual consumption, so you can cut down food wastage. Heavy, unhealthy meals do not make employees feel good after food. We would want you to stay sharp and productive even after food. As they say, healthy, happy staffs are the building blocks to a productive and successful company! 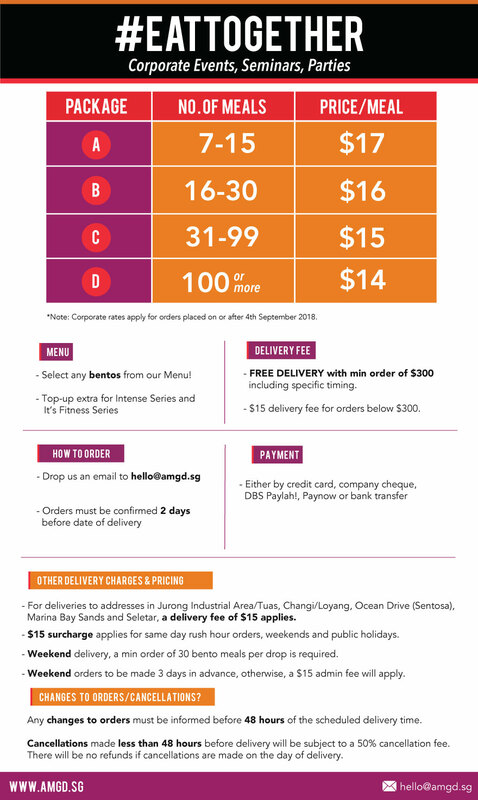 Convenient delivery made islandwide! Our corporate package allows you to order anytime from 7.30am to 7.30pm and we deliver islandwide. Order in advance or last order by 9am on the same day. Interested? Say hi to us at hello@amgd.sg or fill up the enquiry form down below!